St John’s forward Odhran McKenna gets his shot away as Glen captain Ciaran McFaul attempts to block. The Derry side retained the Paddy McLarnon Cup with an eight-point victory at Creggan on Sunday afternoon. WATTY Graham’s retained the Paddy McLarnon Cup with a comfortable eight-point win over St John’s at Creggan on Sunday afternoon. 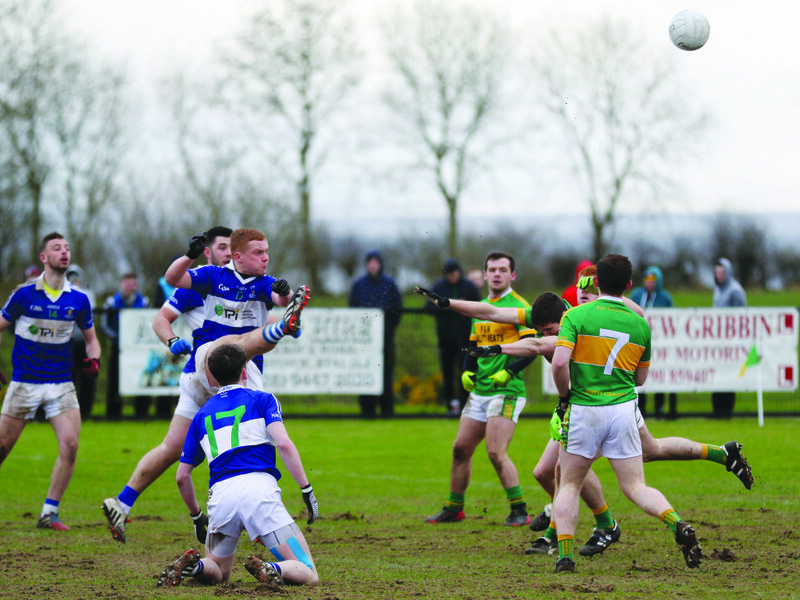 The Glen side have become accustomed to success at underage level and they always looked the more likely victors in a stop-start affair which saw referee dismiss four players. St John’s defender Ciaran Garland picked up a black card in the last minute of the first half but an early booking meant he couldn’t be replaced while Jack Hannigan (black card), Ciaran McFaul (second yellow) and Michael Bradley (straight red) were all given their marching orders in the second half. Glen took a 0-5 to 0-3 lead into the half-time break playing against a strong breeze and eased into a seven-point lead midway through the second half. A goal from Padraig Nugent, who successfully appealed his red card against Cullyhana last week to play, gave the Belfast side a glimmer of hope but Jack Doherty’s late major put the game beyond all reasonable doubt. Glen manager Enda Gormley felt his side were always in control of proceedings. “I was never worried, it’s not the case that I thought that we had it won but I thought we were always in the driving seat,” said Gormley. “I thought we controlled the last 15 or 20 minutes of the first half. “It didn’t really show in the half, we gave away a bit of loose possession and the lads knew that themselves in the first half. “St John’s obviously weren’t going to lie down and they put it up to us, putting in a serious effort in the second half. It was only really when we got the goal that you could say that the game was over.” It took the defending champions 15 minutes to register their first score with a Paul Gunning free cancelling out Peter McKenna’s early effort for St John’s. When McFaul slotted over less than a minute later, he gave Glen a lead they would never lose. Both defences were on top in the first half with Conor McDevitt impressively shadowing Matthew Fitzpatrick in the early stages. However, his game came to an abrupt end when he injured his hamstring when chasing a ball into the corner against substitute Peter McCallin. Any notion that Fitzpatrick would have an easier task with McDevitt gone was dispelled when they Glen management moved Aussie Rules recruit Conor Glass into full-back. With their key marksman shackled by a well-drilled Glen defence, St John’s struggled to create chances and their hopes took a blow when Garland was adjudged to have tripped Ryan McDonnell in the last minute of the half and Hurson issued the Johnnies defender a black card, followed by a red. A rally of five unanswered points in the third quarter proved crucial for Watty Graham’s Stephen O’Hara’s stunning long-range point on 44 minutes the pick of their scores. Cathal Mulholland and Connor Carville won a host of breaks for the Derry men and stood firm in defence along with Conor Gallagher. St John’s were given a lifeline when the impressive Ross Hannigan played a long delivery into Nugent was turned on the spot and drilled a low shot past Callum Mullan Young. Glen were then reduced to 14 men themselves when McFaul picked up his second yellow for a late hit on Hannigan while the Glen ’keeper was somewhat fortunate to escape with just a yellow for a two-footed lunge which brought down St John’ substitute Darragh McCallin. Nugent tapped over the resulting free but time was against the Whiterock Road men. Another goal would have left an interesting finish yet it was Watty Graham’s who broke for the crucial score. Substitute Jack Doherty had the easiest of finishes after being set-up by Danny Tallon following a great counter-attack from Glen. Tempers threatened to boil over in injury-time when Jack Hannigan was shown a black card for bringing O’Hara to ground. A member of Glen backroom team then became involved in an altercation with Michael Bradley which resulted in a straight red for the Johnnies ace while Hurson’s full-time whistle resulted in an unsavoury brawl in the middle of the pitch. While Glen boss Gormley downplayed the incidents at the end of the game, his St John’s counterpart, Locky McCurdy, was far from impressed by the performance of the Tyrone official. Despite Sunday’s disappointing finale, McCurdy believes the experience of this year’s U21 competition will stand to his players as they seek to establish themselves in the senior ranks. “That’s what it is all about and I believe we have gotten plenty out of the tournament. “The way the kids manned up – it is all about getting them through to senior. I think it is invaluable what this last few weeks has given to some of them. “It is hard for them to take but they have to take the defeat on the chin. “You can always learn something from it. There is character within that team. “They have learned a lot over this last few weeks especially from last week’s tough game against Cullyhana and today.